Quick overview Why exactly did Van Gogh cut off his ear? Was Warhol an original or just a copyist? This title provides answers to all this. It includes entries that feature cross-referencing and listings of galleries. This magnificent, bestselling reference book finally leaves its old look to join the modern "Penguin" subject dictionary series. Why exactly did Van Gogh cut off his ear? Was Warhol an original or just a copyist? 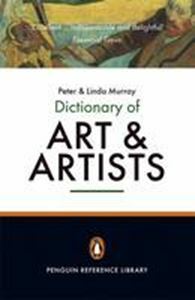 The answers to all this and more are found in "The Penguin Dictionary of Art and Artists", the essential guide to over 700 years of creative endeavour. Each entry features extensive cross-referencing and listings of galleries where the artist's work can be seen.